Chris’s multiple talents have not gone unnoticed. He has solo recordings produced by Jody Stecher and Jim Rooney. With his long-time friends and musical compatriots, Peter McLaughlin and Todd Phillips, Chris shared an Artist-in- Residence position at the Museum of Northern Arizona. 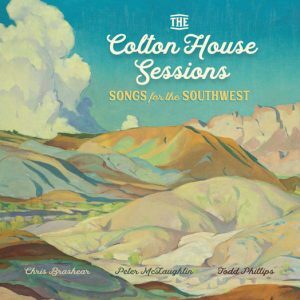 The trio recently released The Colton House Sessions: Songs For The Southwest . Current projects include touring with guitarist Peter McLaughlin and performances with the Piedmont Melody Makers. Around his home in Amherst, Massachusetts, Chris heads up the New City Opry and also plays with Jazz Sketches. New recordings in progress include another collaboration with Peter McLaughlin and a solo project called The Ozark Ballads Collection: Vol. 1. Chris brings over twenty five years of professional music experience as a performer, producer, teacher and recording artist. As a sideman or as a band member, Chris has performed with a variety of artists including Robin and Linda Williams, Perfect Strangers, Kentucky Rose and the Maurizio Geri Swingtet. Chris has taught at numerous camps and festival workshops across the country, including the Augusta Heritage Bluegrass Camp, the Joe Val Memorial Bluegrass Festival, Banjo and Mandolin Camps North, Walker Creek Music Camp, Roots & Boots Music Camp, Berea College Music Festival, the Berkeley Old Time Music Convention and Mars Hill Roots Music Camp.